Click the link below to MA3 Website and you can pay online and become a member today! You must be a member of MA3 to participate in any archery events at our facility due to insurance purposes. Join us for our first mounted archery clinic! Depending on how fast everyone learns, archery and horsemanship skills will depend on how fast the class moves. You could be running patterns on the 2nd day! This clinic is great for the beginner and intermediate archers. 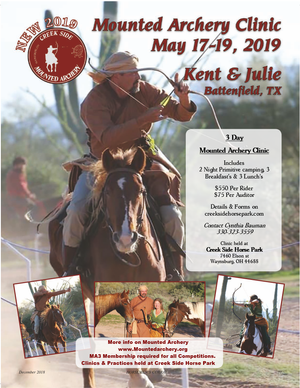 Need for the clinic - Your horse and all your normal tack, Horse bow & Arrows (see MA3 Website for specifics) **We will have bows and arrows there if you need one** Please let us know upon registration if you need a bow/arrows. MA3 Membership is required. Camping is included in the price for Thursday - Sunday. If you would like to camp an extra day it is $25 per day per trailer. All camping is primitive. Water is available for horses in camp. On the MA3 website, there are additional website to get supplies from. Sign up to be a member before you order, big discounts! To encourage beginners ~ we will have Lead (Adults & Youth), Walk/Trot & Canter Classes available at competitions & also ground competition with recurve bows. Park passes are good for all open practice days on the course. We will have bows and arrows with different poundage at the facility if you do not have your own. They will be for rent for $5 per run. Includes your choice of Bow and 5 arrows (additional to the daily park fee).